I eventually gave in to Wayan, a driver who had accosted me a few days before. 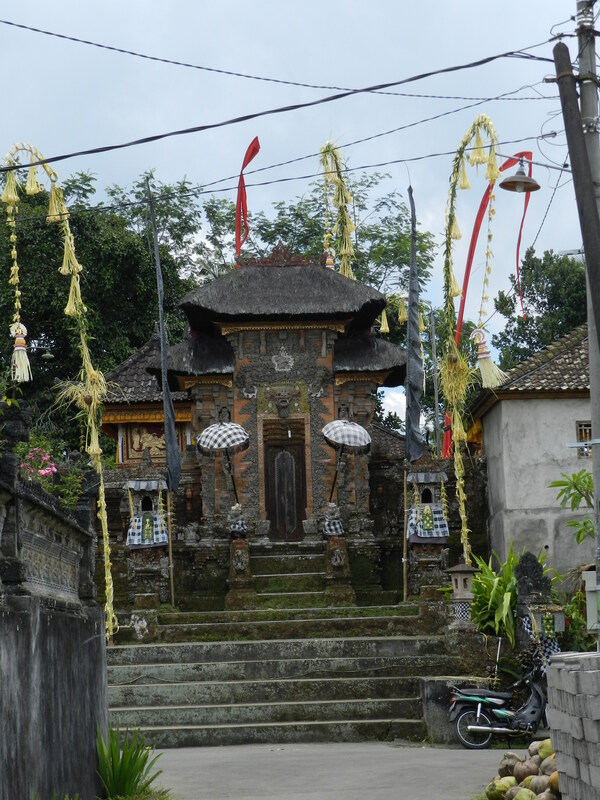 He approached me in the street – remembering my name and that I had told him I wanted to walk around Ubud by myself, that I was doing a cooking class, and remarked upon the red shoes I had been wearing that day. 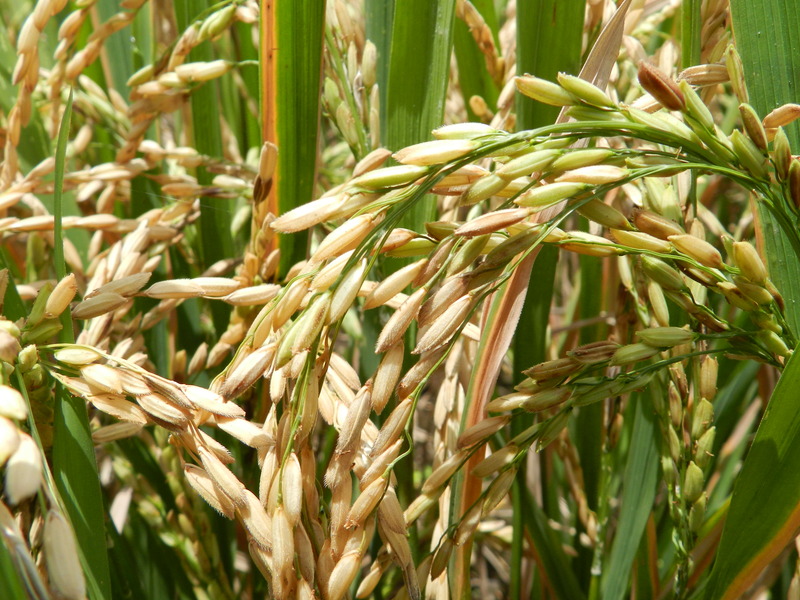 That particular day I had left my room with the plan to go walking in the rice fields by myself. I was wearing trousers, my running shoes ( the closest thing I had to walking shoes – other than a pair of ankle boots and flipflops ) and I had a backpack on – which once it was loaded with two litres of water, my book and my camera- it weighed a fair bit. I really did look like a tourist out for the day, but I had no option. 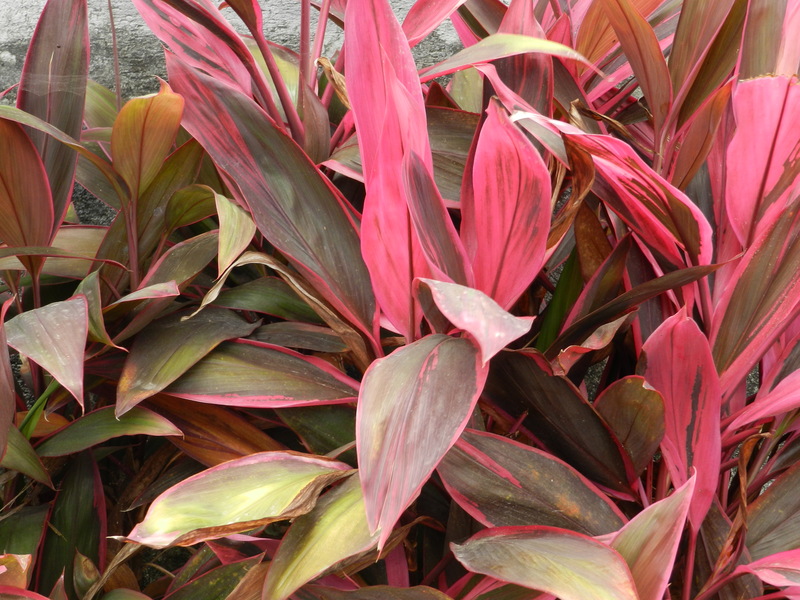 What Wayan didn’t know, and thankfully no one else did was that about a minute before I saw him, I had tripped on an uneven pavement coming out of a minimart – straight down I had gone, and got up as fast as my shaky body would allow me too. I was feeling a little unsteady on my feet so when he approached me offering me a day tour, I was almost relieved not to have to do too much walking. He pulled out his tatty laminated picture card and map and started listing all the places we could visit at a higher price than two days ago. I reminded him of the price he had offered me and he suggested a less interesting itinerary. 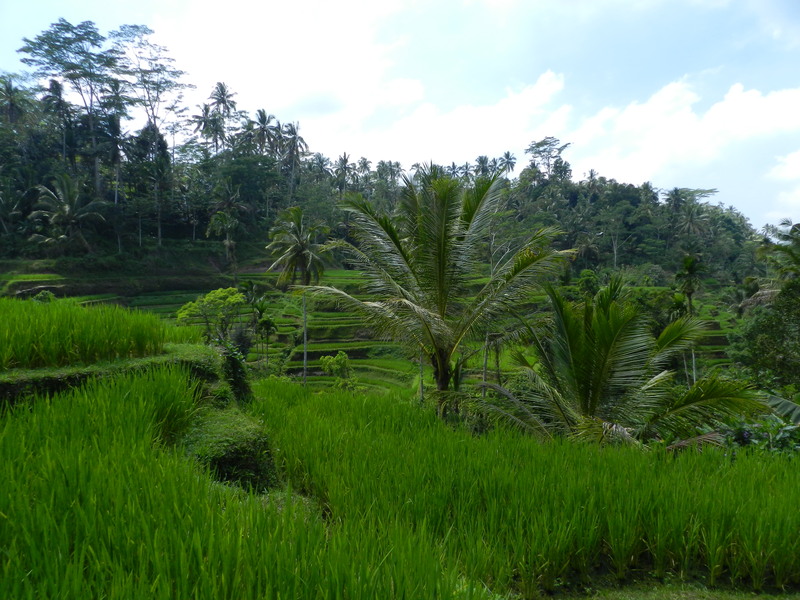 In the end we agreed on a price and my requests were simple: I was tired of all the traffic and the tourists and wished to see “real” Bali – rice fields, villages and something local. Apparently my wish was his command and off we went in his hot and stuffy van. As we drove out of Ubud, I asked him a few questions on how life had changed since the movie and the book Eat, Pray Love. He told me there are so many more tourists now and it’s nothing like it used to be. He also claimed to have met Julia Roberts and had a kiss on the cheek from her. Coincidentally this man was also a healer, a masseuse, a wood carver and yoga teacher and his master was the very Ketut Liyer that Elizabeth Gilbert visited. The man now is quite well known, charges much more than he used to and is extremely busy. Go figure. We approached the village of Tegallalang – which has a number of tourist shops, cafes, guesthouses and of course tourists running around. 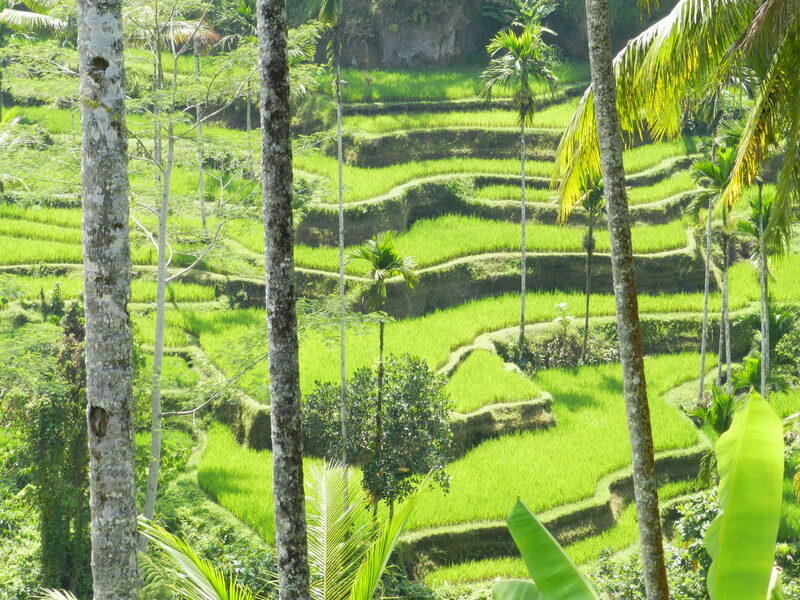 The views were spectacular – the sloped rice paddies and lush green valley. 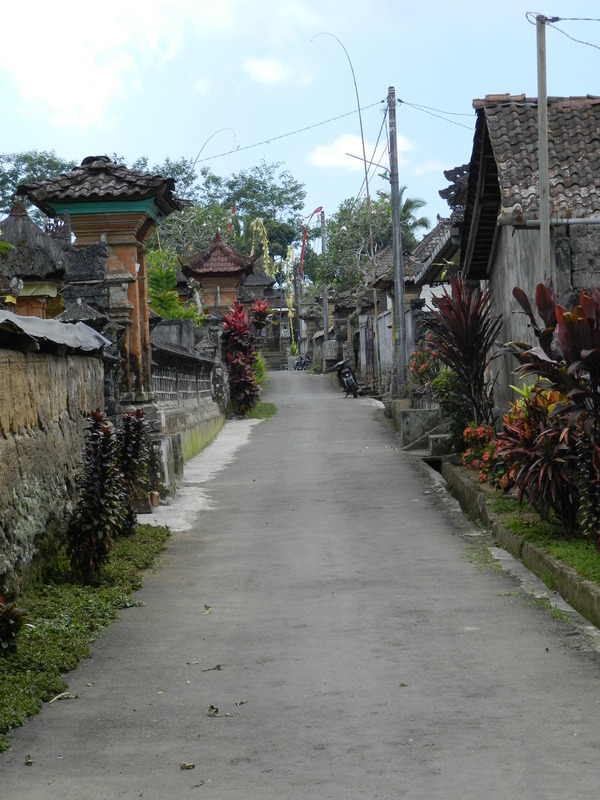 We drove through the village and out of it, as I had requested to get away from the tourists. When Wayan parked I informed him, noting the quickly approaching locals with postcards, jewellery and other wares, that would not appreciate being taken anywhere where I was hounded and expected to buy things. I explained I was on a tight budget and just wanted to look at things – that’s what I was paying him for – nothing else. He quickly shooed away the ladies, allowing me a moment to take a few pics, before they started to approach me again. I know they all work together – drivers bring tourists to areas where people are waiting to sell. Again – I made my position clear. We were joined by another Wayan, with considerably less English, who liked to join Wayan when he has guests. It helps with his English and he enjoys walking through the paddies with him. Fair enough, although seeing that he had a book of postcards I knew I would later feel obliged to buy them. We wandered along the ridges, stopping here and there to admire to view and take pictures. I fell over again! Lost my footing whilst walking on another uneven pathway, coming down on the same knee – this time cutting my trousers and grazing my knee. From then on both the Wayans endearingly ( or just an excuse ) felt it necessary to hold my hands whenever we passed a narrow path or hopped over a paddy. Through the paddies and up a very steep hill into a small village. 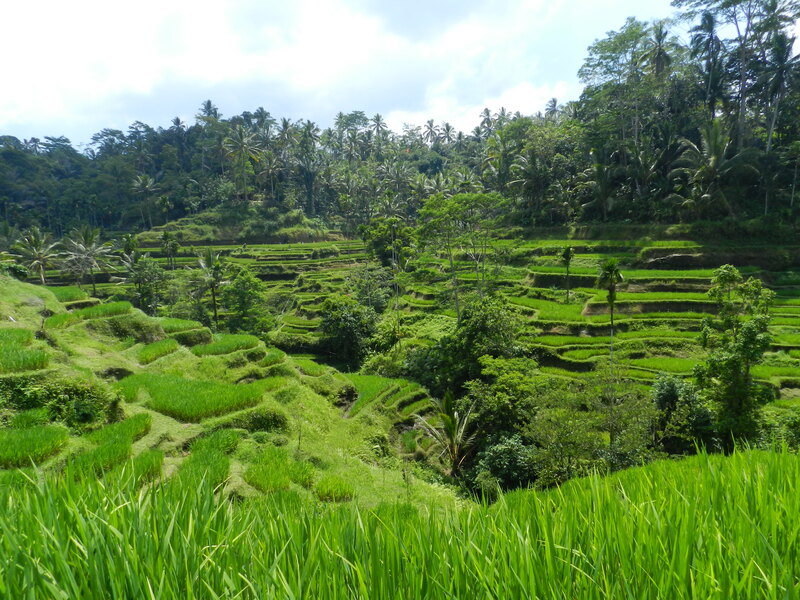 On our way up we picked and ate wild strawberries and Wayan tried to explain the process of rice growing to me. I can’t actually regurgitate it, as I have asked a few people and not always understood the answers! 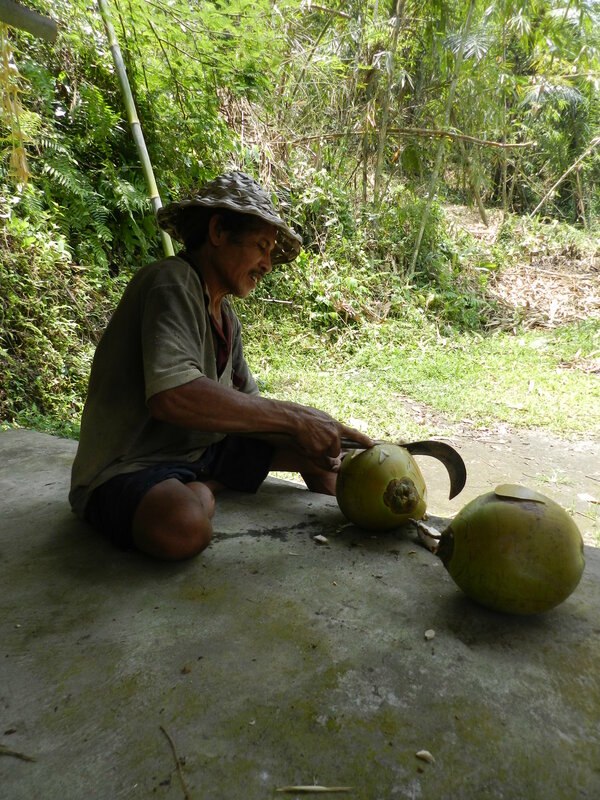 At the bottom of the hill we were met by one of Wayan’s friends who was ready waiting with two coconuts he has just got form the tree. 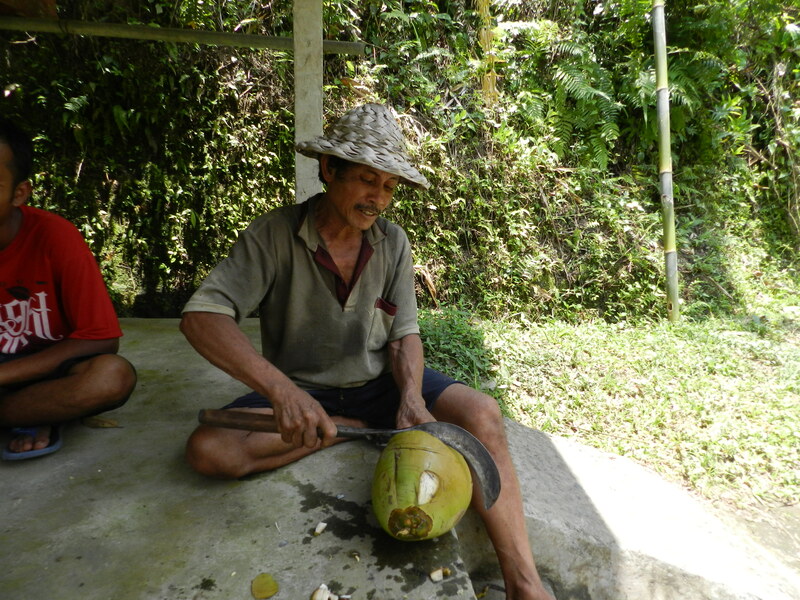 He hacked into both with his knife, made a mouthpiece and handed me the coconut to drink. I was most honoured, and drank what I could, although i wasn’t very keen on the taste – quite sour and having had a funny tummy that morning was a little wary of everything! I have ummed and arred about posting the next two pictures, as I don’t like to photograph people and put them in my blog without them knowing, but I really feel it needs to be shown, and somehow I think this man with the large knife and kind eyes wouldn’t really mind. The next part of the excursion was to an organic coffee and tea plantation where I think I upset the guide by not purchasing any of the overpriced “organic” tea. I thoroughly enjoyed the complimentary tasting, and I knew I would then be walked into the shop and asked to “take a look around” – which really changed the whole mood of the afternoon. Wayan and I agreed on the way back to Ubud that Japanese and American tourists probably DID make plenty of purchases to make up for my lack of. Posted on October 21, 2013, in Australian Adventure and tagged Bali, coffee Lewak coffee, drivers, Eat Pray Love, Elizabeth Gilbert, green, Julia Roberts, Ketut Liyer, organic, photography, rice, rice paddies, Tegallalang, travel, travelling, Ubud, walking, working holiday. Bookmark the permalink. Leave a comment.